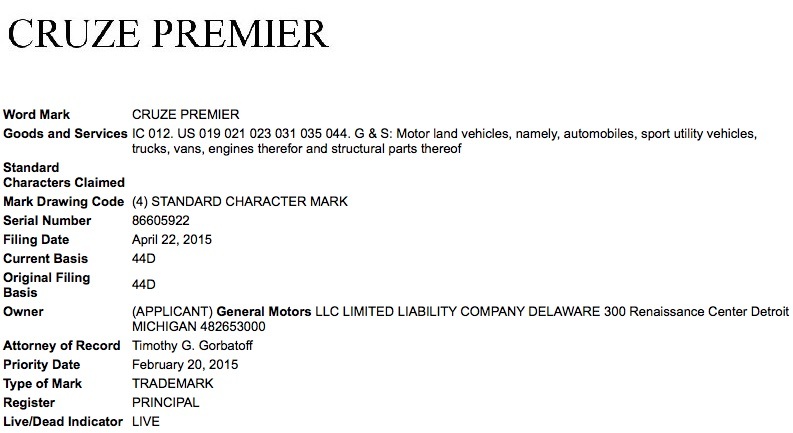 General Motors has filed an application to register “Cruze Premier” as a trademark with the United States Patent and Trademark Office, GM Authority was first to discover. General Motors is in the process of replacing the LTZ trim level on Chevrolet vehicles with the Premier moniker. And if this trademark application is anything to go by, it would appear that the all-new, second-generation, D2XX-platformed 2016 Chevrolet Cruze is next in line to receive the Premier trim. And soon is gonna be, Sonic premier, Impala Premier, Traverse Premier, Equinox, Silverado, Tahoe/Suburban premiers. Guess we should have known this was coming when they debuted the new Malibu with this moniker. I’m undecided yet on it’s effect. I do think it could have been slotted in above LTZ as a super decked out full lux model. Who here has bought a car just for the name? I didn’t think so. You do a car right it makes a name a icon or give the name image but the name will never enhance a car as if the car is not right the best name in the world could save it. You think Rolls Royce or 3M on a Aztek could have made it better? GM in NYC made it pretty clear the LTZ name was going away and Premier was coming to the line. The only real question was Premier going to the trucks or was the High Country name going to replace it. What was wrong with the LTZ designation? I thought it sounded great and has a built-in following with cachet and strong name recognition after all those years? Why throw away all that marketing for something generic sounding like Premier??? If it were me, I would’ve retained LTZ as the luxury model and slotted Premier atop as the fully-loaded model with extra luxuries not available on LTZ. Completely agree. Make Premier the Chevrolet equivalent to Denali for GMC.